Ukraine's New President: Is the Orange Revolution Over? Five years ago, Viktor Yanukovych was the villain who sparked Ukraine's Orange Revolution. Now he is set to become the country's newest democratically elected President. A complete but uncertified count Feb. 10 gave Yanukovych a lead of 3.5 percentage points over his rival, Prime Minister Yulia Tymoshenko, in a presidential race that international observers dubbed "an impressive display of democratic elections." Tymoshenko has refused to concede defeat, though, and her team says it may launch a legal challenge to the result. Few analysts give her much hope of success. Yanukovych's victory marks an astonishing comeback for a man written off in the West as a ballot rigger, a Moscow stooge and a Soviet-style apparatchik. It was claims of massive vote rigging that brought thousands of Ukrainians into the streets of Kiev in 2004. The protests, dubbed the Orange Revolution, overturned Yanukovych's tainted victory and vaulted Viktor Yushchenko into the presidency. But Yushchenko and his on-again, off-again Prime Minister Tymoshenko, a former gas tycoon, fell out and failed to effectively tackle Ukraine's rampant corruption as they had promised. When the economy contracted by a massive 15% last year, Tymoshenko's fate was probably sealed. Frustration and disillusionment kept millions of their supporters at home in this month's second round of voting, especially in the pro-Orange West. Yanukovych's core voters in the East and South turned out in force to cast their ballots for his simple message of change. Ironically, the Orange Revolution helped prepare the ground for the return of the man it once humiliated. "Some say the Orange Revolution has failed. I say no. Thanks to the Orange Revolution, democratic elections in Ukraine are now a reality," says Matyas Eorsi, the head of a team of election monitors from the Council of Europe. How will Yanukovych rule? Since his humiliation in 2004, the incoming President has recast himself as a moderate who sees integration with Europe as a path to higher living standards and wants close but not slavish relations with Moscow. Observers say that after 2004, Yanukovych's understanding of democracy evolved. "In 2007, when Yushchenko wanted to dissolve parliament, [then Prime Minister] Yanukovych's first reaction was to call Javier Solana and ask for mediation," says Olha Shumylo, director of the International Center for Policy Studies in Kiev. "This shows he sees the E.U. as an anchor of democracy." Taking advice from Paul J. Manafort, a political consultant who has worked on numerous campaigns for the Republican Party in the U.S., Yanukovych has learned to speak Ukrainian and replaced rambling, incoherent monologues with short, prepared sound bites. "We shouldn't look for enemies in our country," he said after proclaiming victory on election night. "We should unite and defeat poverty, irresponsibility and corruption." But his famous gaffes have not been completely consigned to the past. During the campaign, he told a crowd they were the "genocide of the nation," when he meant "gene pool." This is more than just an issue of delivery. Scratch the surface, critics claim, and the old Yanukovych shines through. His refusal to debate Tymoshenko in the run-up to the election was slammed as antidemocratic by civil-society groups. Hryhoriy Nemyria, Tymoshenko's Deputy Prime Minister, says Yanukovych's team is "Jurassic Park II," with many of the same advisers who worked with his political patron, former President Leonid Kuchma, and were allegedly involved in financial and vote-rigging scandals. To get beyond that image, Yanukovych will have to give substance to his rhetoric and show a real commitment to democratic principles and reforms of the opaque energy sector. He will also need to force Big Business to play by the rules. Success there will depend on how he handles his powerful corporate backers, who are pulling him in different directions. One wing of supporters is made up of industrialists from the East who are interested in European markets; the other reportedly makes its money from the gas trade with Russia. "Yanukovych is very much influenced by the circles around him. Now it's a matter of which circle will have more influence over him. The problem is that nobody knows yet," says Shumylo. 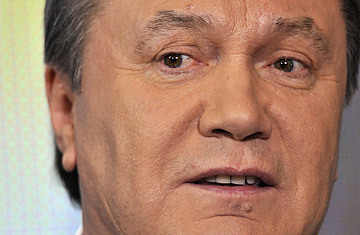 Another key will be the government he forms, assuming he ousts Tymoshenko as Prime Minister. The Russian authoritarian model is not tempting to many of the oligarchs who back Yanukovych. "They don't want to become politically dependent on Russia. They're worried they'll meet the same fate as [Mikhail] Khodorkovsky," says Viktor Nebozhenko, a political analyst in Kiev, referring to the jailed Russian tycoon. Whichever path Yanukovych takes, there is little doubt that the unambiguously pro-Western policies of Yushchenko will come to an end. The new President has outlined a vision of a neutral Ukraine and, citing low domestic support, will not push for membership in NATO, although he has said continued cooperation would be "beneficial." But this doesn't necessarily signal a complete end of orange, as many commentators have predicted. After all, the protests five years ago were first and foremost about the people's right to choose their leader. "I think Ukrainians will be embarrassed about their choice," lamented the outgoing Yushchenko, who opposed both candidates, after voting Sunday, Feb. 7. "But that's also democracy."